Apple Business Chat, which is customer service through iMessage, is expanding to a total of 10 new partners and technology platforms. Apple on Friday announced that satellite TV provider DISH, concessions operator Aramark, hotel chain Four Seasons, food and gift producer Harry & David, and credit card company American Express are adopting the service. Aramark is launching a 10-game pilot of "Brew2You" at Citizens Bank Park, home of the Philadelphia Phillies. By scanning a QR code on their seat back, fans in three sections can use Business Chat to order beer or water and have it delivered to their seat. DISH Network is deploying Business Chat to customers nationwide, to allow them to contact a live agent to ask questions, make account changes, and schedule an appointment. They can also use their credit card on file to order a pay-per-view movie or sporting event. Four Seasons will enable guests to search for any Four Seasons property and instantly engage Four Seasons Chat, a multi-lingual chat service, helping guests to engage with Four Seasons teams anywhere, at any time, for any need. Harry & David customers can chat with a gift concierge about a product or service, or ask any other questions they might have. American Express is kicking off a pilot program for card members to get account information such as their balance, payment due dates, points balance, as well as ask for a card replacement, dispute a charge, get information about their card benefits, and more. Apple also announced five new technology platforms supporting Business Chat, including Cisco, eGain, Kipsu, Lithium, and Quiq, that businesses can integrate with to handle routing of inbound communications and so forth. Apple Business Chat also powered the official concierge service for Cannes Lions in June, with LivePerson. 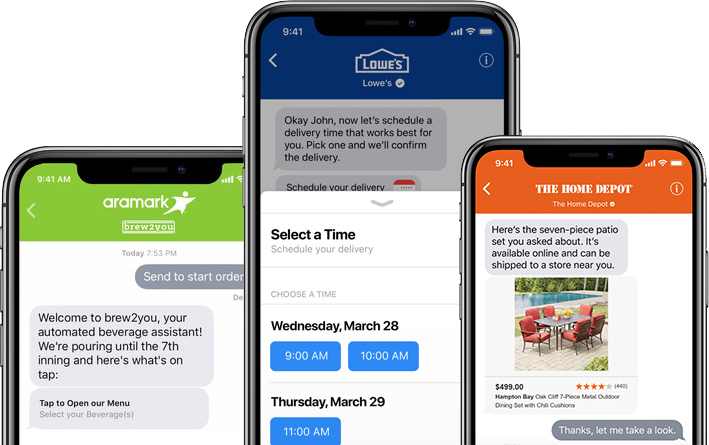 Other companies using Business Chat include Apple itself, Discover, Hilton, The Home Depot, Lowe's, Marriott, Newegg, T-Mobile, Ameritrade, Wells Fargo, and 1-800-Flowers. Apple says it has seen "strong interest" in the service. Would it be ironic if we can chat with Samsung or Huawei customer service on iOS 12? $6 for a bottle of water! ****ing crazy! Does anyone find it ironic that Apple themselves don’t support business chat? They do, Ive used it several times. I’ve applied for business chat access a long time ago and still haven’t heard anything back. I don't see these kinds of service becoming successful while Apple chooses to be a walled garden. I wouldn't count them out. That "walled garden" is the most valuable ecosystem in the world with hundreds of millions of consumers around the world. The most affluent of any group. It's part of the reason Apple Services alone is one of the largest revenue producers in the world with over $50 billion a year in revenue and spiking ever higher. People mistakenly assume Apple wants to be dominant in numbers when they have never worried or desired to be that. They are focused on improving their ecosystem with the best quality products and services they can offer and that has paid off handsomely in every market they enter. I used this recently with Home Depot and to be honest it was pretty good. I did the whole back and forth in my own time without emails to “Peggy” and resolved the issue easily with no awkward phone calls unlike most places. Edit: Nevermind, I tried it with 1-800-my-Apple and that didn’t work. I did it the wrong way.